Several news agencies are reporting that four British ships used during the United States Revolutionary War have been found off the coast of the state of Rhode Island. The archaeologists have identified one ship, the "Lord Sandwich," which was reportedly once the Cook's Endeavour. The ships were intentionally sunk by the British to prevent French takeover of the ships to aid the Americans. The Captain Cook Society has an international membership from countries such as Australia, Canada, Japan, New Zealand, Sweden, United Kingdom and the United States. Members receive a free quarterly publication called Cook's Log. Each issue contains articles on many aspects of James Cook's life and those associated with him. Membership is open to anyone interested in Captain James Cook, whether professionally or as a hobby. DALLAS, Texas, March 24, 2005 – Built for the Natural History Museum of London in 2000, the “Voyages of Discovery” exhibition was created to highlight British sea voyages of the eighteenth and nineteenth century. These voyages altered the course of human understanding of the natural world and the effects are still felt in science today. Containing examples gathered from around the globe, this exhibition made public the historic voyages of such noteworthy vessels as The Endeavor and The Beagle and illustrious members of their crews; Captain Cook, Sir Joseph Banks, and Charles Darwin. Following a successful run in London where it attracted approximately a half a million visitors, the exhibit traveled with great success to four museums in the United States; Denver Museum of Nature and Science, Houston Museum of Natural Science, The Smithsonian National Museum of Natural History and the LA County Natural History Museum. Upon conclusion of its US tour, the exhibition was temporarily stored in Los Angeles, CA with an undetermined final disposition. “In Late November of 2004, EXHIBITTRADER.COM was approached by the museum in London and negotiated a contract to create an interactive flash presentation and dedicated web page to promote the components being sold”, says Jason Wooten, Director of New Business Development. The traveling expose was originally built for approximately $750,000.00, the components included 117 humidity controlled and fiber optically lit glass/metal display cases, integrated electronic components, reconfigurable wall structure, cabinetry and graphic elements. EXHIBITTRADER.COM through its exclusive Internet portal and extensive database was able to connect the Natural History Museum in London with an interested buyer in the US and the majority of the traveling museum components were recently sold for an undisclosed amount. This website was feautured in the Red volume 5.O of the World Online Digest. The CD-ROM's purpose is to serve as a way to quickly move between a few selected web sites on the CD rather than on the slower Internet. Sofware is also included. A letter written by Cooks Clerk and signed by James Cook in July 1768 was auctioned in Auckland, New Zealand on the 18th January 2000 and was sold for NZ$57,375 approx .US$ 28,000. The single sheet manuscript was addressed to the Commisioners of the British Admiralty asking for permission to provision the vessel Endeavour for its first voyage. A spokesman for Sydney based Horden House who purchased the letter on behalf of a client said the price was" fairly hefty- but we would have gone further". MARINE explorers believe they have found Endeavour, the ship in which Captain James Cook discovered Australia, lying in thick mud at the bottom of an American harbour. It is now believed the Endeavour ended its days as a transport ship and was scuttled by the British as they made their escape during the American War of Independence. Marine archaeologists searching Newport Harbour, Rhode Island, have found an 18th century wreck matching the Endeavour's specifications in the place where local legend says that it sank. Yesterday they obtained a court order protecting the site to enable further exploration. Following its triumphant return from Cook's expedition of 1768-71, during which he discovered Australia and New Zealand, the Endeavour was refitted by the Admiralty and returned to its original role as a collier. For years, historians believed the ship had rotted away in a Thames shipyard or was sold to a French whaling company. After the glory of sailing into Botany Bay, the Endeavour was believed to have come to an inglorious end. In Newport, however, locals have maintained that the ship was sitting at the bottom of their harbour. Two Australian historians concluded in 1997 that the Rhode Islanders' wreck was a later Cook vessel, Resolution, abandoned in Newport in 1793. The case seemed to be closed. However, Dr Kathy Abbass, head of the Rhode Island Marine Archaeology Project, was convinced that the historians were wrong. Earlier this year, she spent a week at the Public Records Office in Kew, trawling through Admiralty documents. She found that Endeavour was renamed Lord Sandwich in 1776 and put into service as a transport vessel for troops and convicts. The measurements of Endeavour and Lord Sandwich matched. Then, in a Navy Board list from 1778, she found that Lord Sandwich had been sunk during the Siege of Newport. "I couldn't believe I had it," she said. "It showed us that Endeavour was here, now, and as archaeologists we had to find it." Three transport ships sunk off Newport in 1778 had tonnage of more than 300 tons like Endeavour, making the odds that the wreck under investigation was Cook's ship just one in three. These odds improved when divers found an 80 foot timber matching the dimensions of Cook's vessel Abbass said: "We do most of our diving in the summer, so we should know for sure whether we have found Endeavour by August." Ian Boreham, the British editor of Cook's Log, a publication devoted to the study of Capt Cook, said: "I believe that the possibility that the ship is the Endeavour is strong enough that future investigation must take place. "One would love the most romantic thing to be true, namely, that she really is still alive or, rather, slumbering." here at the site by fleetwood, you can buy a first day issue postcard and 13 cent stamp of Captain James Cook. The postcard is an original painting for the Fleetwood® First Day Cover by Charles Lundgren. Actual size: 6-1/2 x 3-5/8 inches. Reverse of FDC contains historical background text. Those of you who are philatelists may already be aware but some others might also want to know that in the 2nd set of 4 postage stamps being issued to celebrate the (almost) past Millennium -- a series of 48 at 4 per month of 1999 --one is devoted to Cook's accomplishments. "The second set ... focuses on travel (&) is called Travelers' Tale. .. . "Capt. John (sic) Cook's 18th-century pioneering explorations are the inspiration behind the 63p stamp ... for the second step airmail rate. "Capt. Cook, who was born in Yorkshire in 1728, set new standards of thorough- ness in discovery and seamanship, in navigation, cartography and the applica- tion of science at sea. And in the process, he changed the map of the world more than any other individual in British history. "... (the) design depicts Cook with a Maori man with a tattooed face. Australian flora also is (sic) pictured. "The portrait ... is from Britain's National Maritime Museum in London... "Royal Mail is offering a presentation pack containing a full set of (4) mint Travelers' Tale stamps and a brochure with backgroundinformation ..."
They are scheduled for release 2 Feb. Let us hope the first name error is that of the ignorant U.S. writer & not of GB Royal Mail! Unfortunately, being the high value of the set. 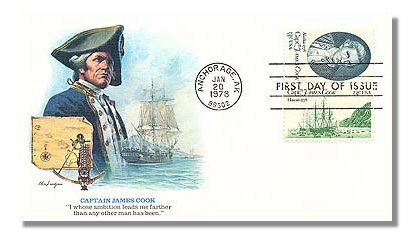 the Cook stamp will see the least postal use but it is an improvement over the only other GB stamp "honoring" (OK, "honouring") Cook, 30 or 40 years ago, which showed only his ship & his autograph -- but not Cook. The reproduction of the new stamp in Linn's shows. however, that the "Millennium" inscription runs vertically across Cook's lower face (up to his eyes) -- somebody at Royal Mail doesn't seem to like "our" hero! along the west coast of North America from April to October 1999. The announcement of Endeavour's 1999 West Coast Tour was made by the H. M. Bark Endeavour Foundation, the non-profit organization that operates the historic vessel. miles, completing successful tours of Australia, New Zealand, South Africa and the United Kingdom. This will be her first visit to the west coast. Referring to Endeavour's forthcoming west coast tour, Captain Chris Blake, Master of Endeavour, stated, "As we approach the last leg of Endeavour's circumnavigation, we are looking forward to sailing in Cook's wake along the west coast of North America." in February 1999. From April through October, the historic vessel will make stopovers in ports of call along California, Oregon, Washington, and British Columbia. At the end of her west coast tour Endeavour will begin her sail back to Australia via various islands and New Zealand, arriving in the year 2000. On the original Endeavour, how did Cook's crew of 94 men work, eat, and sleep? In port, Endeavour becomes a floating museum, transporting visitors back to Cook's time, over two hundred years ago. Visitors journeying above and below deck, witness the mystery, adventure, and hardship of life aboard an 18th century sailing vessel. John Longley, CEO of the H.M. Bark Endeavour Foundation, describes the museum replica, "She's a time machine....You will find food on the tables, uniforms spread out in the officers' quarters, hammocks still slung, and half-finished drawings in Cook's great cabin." Volunteer guides stationed throughout the museum retell the story of the original H.M. Bark Endeavour. Historical authenticity was the primary concern when re-constructing Endeavour, and she is built to the exact specifications of Captain Cook's original ship from plans held by the National Maritime Museum of Britain. For Endeavour's exhibition itinerary or information about special discounted rates for youth or school groups please call the H.M. Bark Endeavour Foundation on (703) 519 4556. The original H.M. Bark Endeavour is one of the best-known ships of world exploration and navigation. Commanded by Lt. James Cook, Endeavour sailed around the world from 1768 to 1771 on a voyage which forever altered world charts and botanical knowledge. Cook's voyage produced extensive geographic knowledge of the South Pacific, New Zealand and Australia. On the voyage, Cook reached Tahiti in the Pacific where he viewed the transit of Venus across the sun, and then sailed south west to prove or deny the existence of a "Great South Land." After charting the existence of the two islands that make up New Zealand, Cook again headed west and sighted the east coast of New Holland, now Australia. He followed the coast north and anchored in what he named Botany Bay. While Cook was not the first European to "discover" Australia, he was the first person to accurately map the eastern coastline. Ocean with the Pacific Ocean. This dream had captivated mariners for centuries. Although others would still try, Cook's voyage along the Canadian and Alaskan coasts and north across the Arctic Circle proved that a practical north west passage would remain a dream. Leaving North American waters at the beginning of winter 1778, Cook returned to the Sandwich Islands (Hawaiian) which had previously discovered, and it was here during an incident with the Hawaiians that he was killed at Kealakekua beach on 14 February 1779. Live life at sea as Cook and his bold crew did 200 years ago! between ports of call along the west coast. Crew members take on a demanding routine of sailing around the clock, lectures, eating and catching sleep in hammocks. Endeavour is fitted with modern navigational equipment, engines, and safety features to meet maritime restrictions. There are also a modern galley, heads and showers. The H.M. Bark Endeavour Foundation is also seeking crew to sail from Halifax, NS on voyages from mid-October 1998 to February 1999 between the following exotic stopovers: Bermuda, British Virgin Islands, Barbados, Panama Canal, Galapagos Islands, Acapulco, Cabo S. Lucas to San Diego. Voyages range from six to sixteen days in length. As part of the ship's educational outreach program, the H.M. Bark Endeavour Foundation is providing half/fare educational grants for young adults (ages 18 - 24) to sail onboard Endeavour. These grants are generated during exhibition by donations from the public to the Captain's Fund. Young adults are invited to apply for Captain Fund Berths to sail the upcoming legs from Halifax, NS to San Diego, CA. One young adult from each port of call will be nominated. While representing their respective ports of call, the fifteen young adults that are selected will participate in all aspects of 18th century sailing and write weekly update reports about their sailing experience. Local hosts are seeking sponsors to cover the remaining cost of these berths. Those young adults interested in applying for a Captain's Fund berth are requested to contact their local Endeavour port of call or contact the Endeavour Foundation on (703) 519 4556. Volunteers are needed in every port of call to assist with guiding the public through Endeavour. Volunteers will undergo training, receive instruction booklets and guiding polo shirts and hats, and enjoy a 'thank you' party on board at the end of the ship's visit. chance to experience living conditions aboard the 18th-century vessel. This opportunity is free of charge. Must be sixteen years of age or over. (Groups where individuals are under 18 years of age must be accompanied by a supervisor). Cocktail parties and private formal dinners can be held on Endeavour. For information about private and corporate entertainment aboard Endeavour please call Lyn Dower on (703) 519 4556 or email lyndowr@ibm.net.